Kellie Miller Arts on Market Street are thrilled to announce that one of their artists, ceramist Patricia Shone, has been selected to have one of her landscape-inspired works in the V&A’s permanent collection. Shone’s work, which are built by hand and are informed by the landscape of the Isle of Skye (where she lives) and the patterns of erosion and decay in the geology of the land, was awarded the prestigious Emmanuel Cooper Award, after being selected last month by The Craft Pottery Charitable Trust. For the last five years, the Trust invites a museum with a notable collection of contemporary ceramics to select a piece of work at Ceramic Art London which they would like to acquire for their permanent collection. The Trust buys the work from the potter using a bequest from the estate of the late Emmanuel Cooper and donates it to the museum – which for this year, is the V&A. “Having recognised Alun [Graves, a senior curator in the department of Sculpture, Metalwork, Ceramics and Glass from the V&A] from other shows I was just happy that he stopped to speak with me about my work, that felt like validation enough. So when the award was announced an hour later, I was speechless,” Patricia Shone, who has also previously won the Craft & Design Magazine Gold Award in ceramics, says. Shone’s ceramics will now be kept in the V&A’s permanent collection, however, if you want to see her pieces more locally (and have the opportunity to purchase one, unlike at the museum), visit Kellie Miller Arts on Market Street. 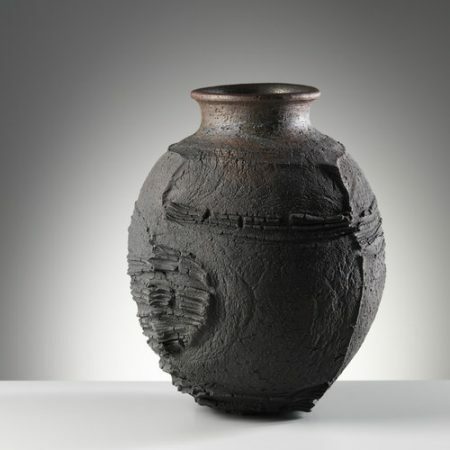 Shone’s one of the award-winning gallery’s artists who they’re pleased to have new pieces from all year round – (including her Erosion Jar, pictured here). Opening Times: April to December Monday to Saturday 11-6, Sunday 11-5.